Want to hear the music I’ve recorded in musicians’ homes and at community events over the last bunch of years (starting in 1976)? This post will show you how to get there quickly. Want to know a little more about these traditional musicians and the events they participate in? This post will also show you the paths to take to learn more. Start here. These five links live directly below the banner photo on drdosido.net. They will always be there. The first four are gateways that lead to DrDosido’s collections of recordings. The last leads to written reflections about the people I’ve met, music collected and friends made. These gateways open on to the multiple paths I’ve followed in my life as a folklorist and fiddler. I’ll describe each pathway in just a bit. First, it might help you to know how the site is put together. When you click a link to pass through any of the collections gateways, you’ll come to an explanatory landing page. On the right is a sidebar with links that lead you down one of three separate paths. The top three links lead to rosters of artists and events arrayed as tables of pertinent data. The rosters contain more links that lead you directly to recordings of a particular artist or event. On the top of each roster is a link that gives you the option to browse the whole page of recordings covered by that roster. The bottom three links in the sidebar let you bypass the roster and go straight to a browsing page. In a few of cases, additional links lead to more browsing pages. All browsing pages have links that lead back to their related roster. Brief descriptions of the four collections gateways and their pathways follow. Indiana Hoedown was the name of a show I did on public radio in Fort Wayne for a few years. 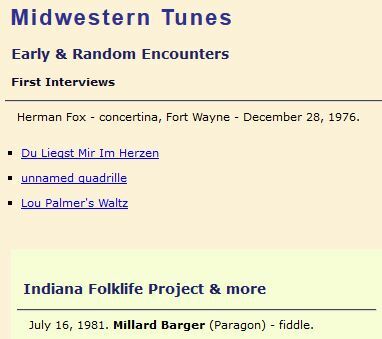 In 1979 I received two grants to 1) make field recordings of traditional musicians in the state of Indiana, and 2) present highlights from these recordings in a special series of 26 radio shows. In the mid-1980s I received two more grants to 3) record ethnic dance bands in Northern Indiana. 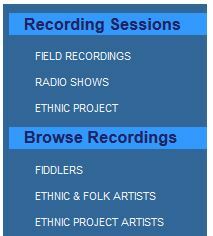 The field recordings roster links to two browsing pages. 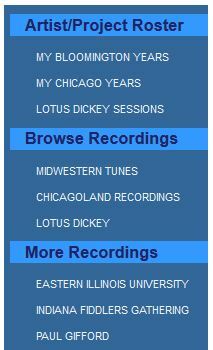 When uploaded, the radio programs will be linked directly to the radio roster with no separate browsing page. 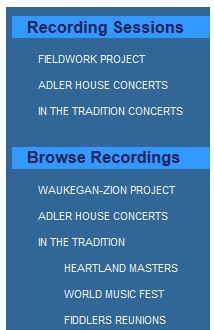 Adler House, aka the David Adler Cultural Center, was an arts and music center in Libertyville, Illinois, where I was variously engaged for the span of twelve years. The three pathways linked here are a 1) fieldwork project for which I was the contracted folklorist in 1987. The 2) concerts link presents some relevant performances from before and during my time at Adler House. 3) In the Tradition was a special series of concerts for which I began as project folklorist and ended as producer in the later formats. It gets its own subsidiary landing page. The In the Tradition roster is presented complete, and is also broken into three smaller segments, each with its own browsing page. Old Town School highlights my quarter century (and counting) at the Old Town School of Folk Music in Chicago. 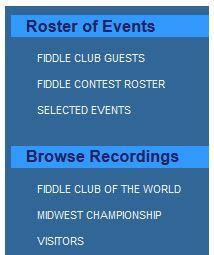 In 2008 I established the 1) Fiddle Club of the World for alumni and friends of the fiddle program. [After six years, the Fiddle Club is now independent, but still on friendly terms with the School.] In 2003, I began an annual 2) Midwest Fiddle Championship held in conjunction with the School’s annual summer festival. The last link presents recordings from 3) selected visitors to the School – concert and workshop artists – that I had the good fortune to work with. Tune Catcher covers smaller contract and research projects I have done, as well as the informal collecting that goes along with being a part of a national and international community devoted to traditional music. Two of the three pathways that begin here split into separate forks. The 1) Great Lakes pathway is devoted to traditional music in the Midwest. I’ve divided it according to my graduate school years in Bloomington, Indiana from 1978-86 (including some prior activity from my time living in Detroit), and my Chicago years, since 1986. I’ve devoted a whole separate pathway to Lotus Dickey of Paoli, Indiana. He was my mentor and friend. 2) Here & There highlights musicians from states outside the Midwest, including a handful that hail elsewhere in the world. I also give separate space to my contract fieldwork for the Wyoming Arts Foundation. The last pathway leads to 3) recordings that were shared with me by my friends. The Reflections pathway is similarly constructed, though the rosters and browsing pages are merged. Published Articles and Short Pieces are rosters presented as a graphic bibliographies. As you browse these pages, some of the links you find will lead directly to an piece written by DrDosido. Others may lead you to your local library. I’ve just begun construction on a photo gallery. 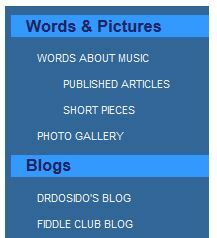 DrDosido.net also hosts two blogs: the Fiddle Club of the World blog and this one (DrDosido’s blog). Finally, I should mention the menu buttons that appear above the banner photo. The Road Map provides two different views (1 or 2) to help you figure out what is where and how to get there. Additions contains notices of recordings recently uploaded to Drdosido.net. This is, after all, a work in progress. Related Links and About DrDosido are standard fare. this is impressive! looking forward to exploring your work! What a wonderful contribution, Paul. It looks like an amazingly rich repository. I’m so glad you have been conscientious in saving everything. This will be a great model. So, how are you? Everybody well, I hope? Can the content be broadcast? I’ve got this little problem. Because the government shut down for two weeks, thereby pushing the FCC filing window forward two weeks, I had, acting as Attorney, extra time to file two applications for low-power FM. Result: two construction permits in the last two weeks from the FCC for low-power FM, community stations, not college stations, not religious stations. One, Kirksville, MO, under the name Rural Felicity: KRFR-LP is the reserved call sign. A Missouri nonprofit. The other, Ludington, MI, under Taproots Arts Society: WXYS-LP is reserved. A Michigan nonprofit. Separate corporations, separate Boards. Both are supposed to do local programming. Both are supposed to emphasize in their broadcasting traditional folk music, regardless of ethnic or national origin. 18 months allowed to build these things and get them on the air. According to Andy Cohen, the presence of traditional folk music on the airwaves has been diminishing. Mine is one response. Paul’s website is another way. People, especially young people, don’t know what they are missing, because they can’t find it. Ideas (and help) appreciated. You can, if you wish, leave a reply under “Radio” at ruralfelicity.org.